Glad you like the site and hope you find lots more Velvet Shank. The stem texture is unmistakable. Keep your eyes open for new additions to the site. It’s a part time project and hope I have more time soon to make it grow bigger and better. Yesterday 30th Jan I found some fungi took photos and brought some home too, didn’t know what they were as I am new to this (1yr). Read up on here with some good photos from John to help and found they are Velvet Shanks, loads of them on a fallen log, read up on here, and have left over night to do spore test next, so thanks again John for all the info and written help. Last week I found loads of Morels again with your help on identifying and have dried them for later use, and now looking forward to the Dryads Saddle later on, very tasty too. Forgot to mention when I found the Velvet Shank I also found Pixi caps, small orange red on small twigs loads of them, just coming through, all this within 5 mins walk from my house, how lucky is that? Hi Ginny. It’s good to find so many things especially when it’s on your doorstep (so to speak). Velvet Shank should be out in force at the moment. I’m surprised you’ve found some Morels recently as they usually appear in April/May. But the weather has been mild and I recently found a Spring time species last week. Crazy weather!? I’m new to this site,and am still very busy reading up on mushrooms.I used to love mushrooming as a child! (field mushrooms). I found a nice bunch of Velvet shanks the other day….I saw them from a distance growing about 6ft up a big dead ash tree..”wow.. Is that Honey Fungus?” I asked myself.They seemed colourfull in the dull wood. They looked sweet,though slippery and sticky…… Yes I was very pleased to have found somthing! I took one specimen home,,got about 7 books out and after 3 days of flicking to and fro,,,I was doubtless that I had found the velvet shank! My first slightly difficult identification! I must say The Dark velvet stem sticky cap and white spore print eventually put me at rest-so to speak!! Thanks for the follow up. Yes Its a massive space thats been missing from my knowledge of wild food that I needed to catch up on. Otherwise I’d be missing out greatly. I took lots of pics,,as it can be very beautiful.. I think it is a very nutritious fungi and have felt great since first eating it. I find it quite nice slightly dehydrated and fried in lamb fat!…slowly. Think i’ve found some too, just double checking with John. I’m still nervous about mushrooms so i think its worth noting that Sulphur Tuffs and Funeral Bells are vaguely similar i.e brown and cream!! The most obvious difference i think is the Velvety stem. Hi Mark. Thanks for your email and I understand about your identification concerns. It’s hard to tell from the pictures received but they were growing on the right substrate (decaying/stump of deciduous tree) and the right time of year, but they were featured in a (what I thought was) a lumber yard. In direct sunlight instead of a shady wood, as would be the normal scenario, the caps have dried quickly and the margin (edge) have become more warped and wavy than usual and I have seen this before in other species. The stem is usually the best characteristic with it’s velvety texture and very tough consistency. But it’s always good to treble check. Also mistaken for the Velvet Shank is the Sheathed Woodtuft which grows in many numbers too through to early winter. This is quite edible but also can be confused with the potentially deadly Funeral Bell (Galerina marginata) which is usually a little smaller – but mistakes have been made! I have lust discovered a large collection of Mushrooms in my garden -which look like Velvet Shank -they are growing in clumps -small pyramids and I have found roots of trees underneath. Do I have to dig out the old roots of the tree to get rid of the mushrooms or is there a simpler way? I am concerned with children playing in the garden.There was a small number of them last year – however this year they have multiplied and are spreading. I wish there was an easy sure fire way to remove the mycelium (the organism that fruits the mushroom). And each species sometimes requires different removal methods, but it is a very very hard process with varying results. In this case, the Velvet Shank grows only on dead wood (logs and stumps) but not on living trees. To remove the roots would be a good starting point but there is never a 100% guarantee and the mycelium may have spread to other parts of ‘broken away’ decaying wood that may be hard to locate. Try consulting with a professional landscaper who may have better experience with such things. That would a good bet. And fortunately Velvet Shank is non-poisonous and pretty innocent, so no real harm with contact or ingestion would be a real problem. I’m sorry I can’t offer a simple solution, but hopefully an experienced gardener can. Good luck. Many thanks for response. It seems that a fair bit of root digging is the next step if I want to get rid of them . 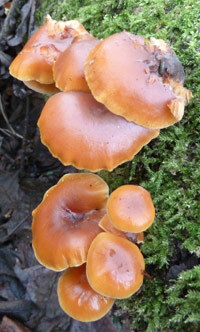 I forgot to mention there are a lot of ‘Armillaria ostoyae’ (a member of the Honey Fungus family) about. They also feed on the dead wood and grow in large clusters too. Look up online using this scientific name to check if they may also be the culprit. They are non-poisonous too, in fact edible once cooked (although can disagree with some people). But I realise you’re not interested in eating them. …just cut open the stem of one and did not find a hollow part in middle of stem as indicated in some references – I am therefore assuming that they are Armillarea Ostoyae. However it seems that the only way to get rid of them is to try and eliminate the dead roots from trees which i find are underneath the mushrooms. I cut down an old Sycamore Tree over 10 years ago and its roots must be the attraction..
Hi Eddie. The hollow part isn’t always that apparent. But the stem itself is incredibly tough unlike ‘Armillaria ostoyae’. 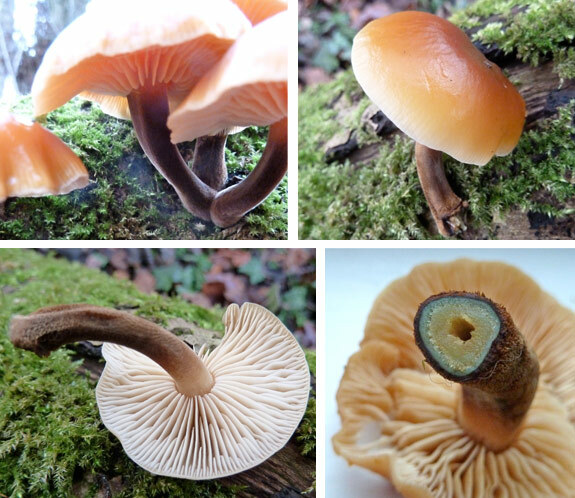 Also the Honey Fungus has a yellowy-white ring on the stem and small scaly flecks on it’s cap whereas Velvet Shank has no ring and a smooth cap which is slimy, more so in wet conditions. Either/Or though, those dead tree roots are most likely the cause.